SOMETIMES I surprise even myself with how weird my life can look sometimes. Picture this. Scissors, paper, cardboard, glue, rope, split pins and buttons all in a heady mess around me. I am lighting matches to burn off the ends of nylon rope - as you do - in my fluffy pink dressing gown given to me several Mother's Days ago by the children (also likely the most flammable article of clothing I own). I have pipe cleaners, dice, zip lock bags - and The Voice is on. If you're shuddering, I won't be offended. 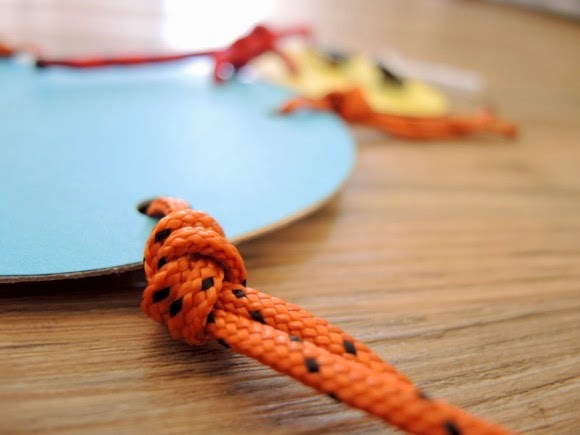 I was happily oblivious in my crafting until I tied off the last piece of newly seared rope and flourished my creation aloft with a mighty "Ta Da" only to be met by the raised eyebrow and pursed lips of my partner. I looked back at my creation, somewhat puzzled it wasn't obvious. "It doesn't even look like a beetle." Talk about crushing. Of course it's a beetle. See it's beady beetle eyes, and it's legs - all four, or maybe eight of them. It's a beetle, alright! And there you have it. The misspent evening of a Girl Guide leader trying, clearly in vain, to create learning resources for her charges. 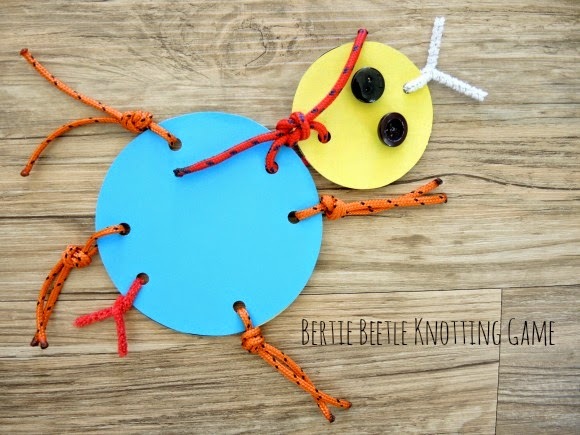 If you're at all intrigued, this IS a Bertie Beetle - sadly not the chocolate variety - and it's a knotting game. 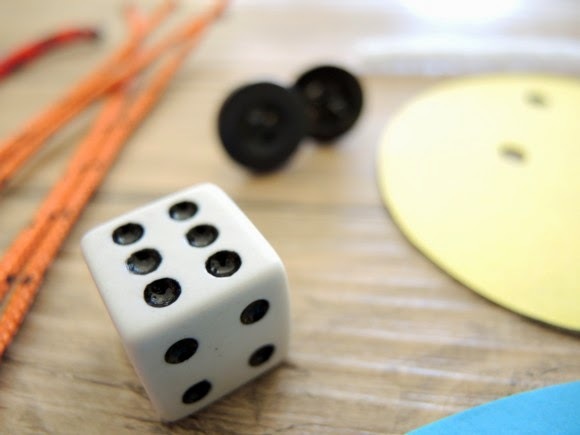 And, if your children are at all crafty and like making their own games, you might like to make one too. Bertie Beetle is played in teams, or Patrols, with a disembodied beetle and a dice handed to each team to start. On go, each member of the team takes a turn to throw the dice. Throw a six: You get Bertie's body. (You must have thrown a six to start). Throw a five: And attach Bertie's head with a reef knot. 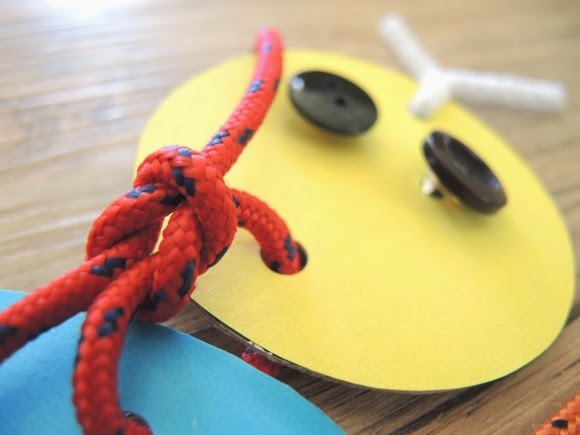 Throw a four: Attach a leg, one with each throw of a four, using a double overhand loop, or reef knot, or two half hitches (or whatever knot you want to teach). Throw a three: Attach the antenna. Throw a two: Attach the stinger. Throw a one: Attach an eye. 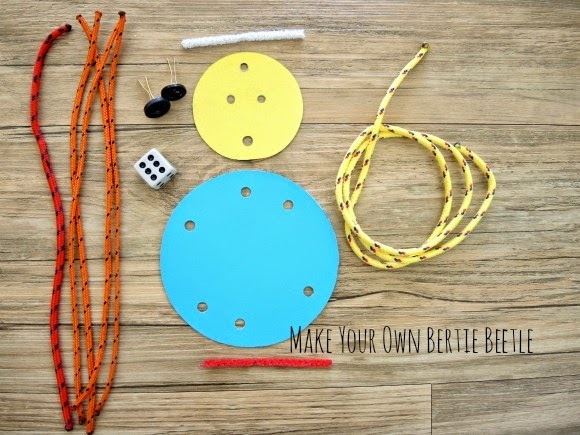 When the beetle is finished, take the longer piece of rope and tie a bowline, pop it over Bertie's head and drag your beetle to a pre-determined finish line a short distance away. Your winning team might even score a real chocolate Bertie Beetle for their prowess, speed, agility and for not laughing at the said beetle. PS: If you do think it looks remotely like a beetle, let me know so I can at least go back and say: "I told you so. It did too look like a beetle". Great idea, will have to try that with my Guides. And yes it does look like a beetle. That is super cool. Can't wait to be doing projects like this in a few years.